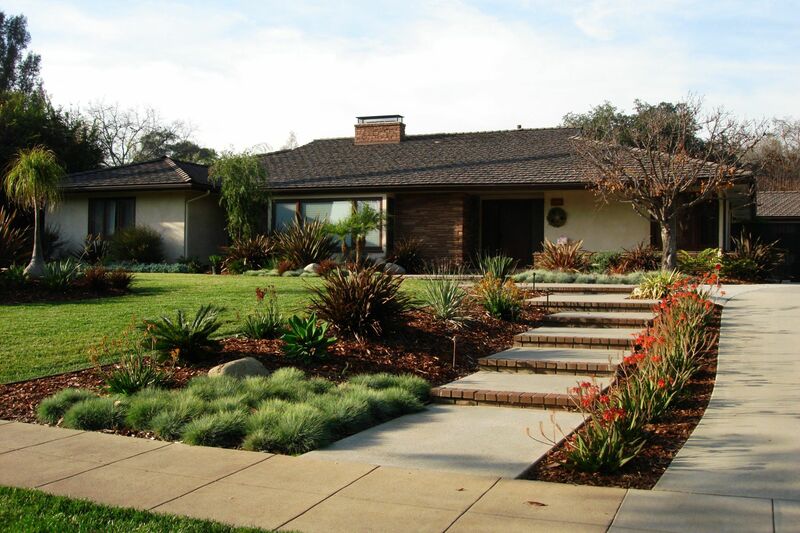 As a Southern California landscape contractor one of the biggest concerns I hear from my clients looking to install drought tolerant planting is whether or not it is going to look attractive. Many are converting from yards that already have nicer elements and decent lawns. They often worry this will look too “deserty” and feel that converting to drought tolerant planting would be taking a step backwards. They envision yards with a sea of gravel or decomposed granite and a one or two cactus sticking out of the ground and quite often can list off a few neighborly examples of this parched look. So, does going low water mean boring and blah? Well I am sure you know where I am going with this and no, they don’t have to be unattractive. To fully understand this we should probably firstclear up some potential confusions about drought tolerant planting. Drought tolerant planting basically means just that - plants that are physically set up to survive environments that have droughts or low water levels. They can survive with less water or less supplemental watering. Some drought tolerant plants actually “use” as much water as some non-drought tolerant types but because their physical characteristics are different,they survive where another would perish. Drought tolerant planting also has potentially confusing terms associated with it too like Xeriscape,(pronounced “ZEER-escape”). This is a term coined by the Denver water department in 1981. It comes from the Greek word xeros, which means dry and Old English -scipe meaning shape or condition. This term was meant to describe landscaping and landscape planting that requires little to no supplemental watering by humans. So really the plants themselves are drought tolerant and the landscape DESIGN is xeriscape. You will also hear the “term”,zero-scape, which in fact is really not a proper landscape term at all. This doesn’t however, stop owners and even other professionals from bouncing it around believing it is describing a form of drought tolerant design. In truth it is more likely a mispronunciation of the true landscape term - xeriscape. If we actually look up the derivation of the two parts ofthe “term” zero-scape, it would be from the Arabic word sifr which means empty and the Old English word –scipemeaning shape or condition. So a zero-scape would be an empty yard or yard in an empty shape. So I guess if we just took everything out and had a dirt lot we would instantly have a zero-scape. Yeah! for all newly built homes. They now come with a zero-scape yard for free!! For most of us this wont work and we need to have our living plant companions close by to feel good. So this means planting which also means irrigation. Drought tolerant does not mean no water, especially in their earlier root development stages. Most drought tolerant planting require at least a full year to create a mature enough root system where they can survive on little to no supplemental watering. Therefor it is recommended that you have an irrigation system in place to help with that critical first year. If not, it will mean hand watering and you have to be more vigilant. Some people like to spend some time with the hose. However, most of us are really busy and need things as maintenance free as possible. With all that said. There are many available species of drought tolerant plants that provide great coverage, color and beauty. A well designed yard will have some balance to it but also create interest with nicely designed rock features, maybe some rolling grades or offsetting ground treatments. So the two elements to keep in mind when making drought tolerant planting attractive are: 1) plant selection and 2) surrounding features. One without the other simply won’t work. If you make great drought tolerant plant selections and leave everything else around it poorly created it will look bad. If you make great features but have poor drought tolerant planting selections and grouping, again unattractive. However combine the two just right and wow! I hope this helps and you find that drought tolerant planting can be an attractive asset to your home and life.